Kick back with the classics. Made from reclaimed records, these coasters will hit it big with music lovers. Made of labels cut from the center of actual vinyl records, these hi-fi home furnishings will be a hit with any music lover. The discs are sealed so moisture won't seep through to the surface. Comes in a set of six assorted labels packed in a clear, round case. Designed by Jeff Davis. Handmade in Philadelphia. 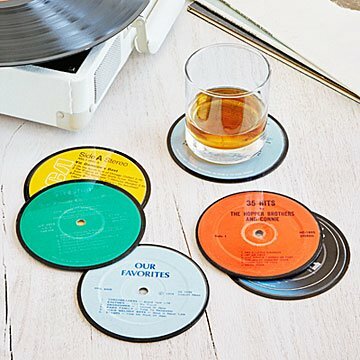 Because these coasters are made from real recycled records, each set will include a variety of music genres. For the record, Jeff Davis specializes in giving new life to old vinyl LPs. With degrees in both industrial and theatrical set design, his background includes the structure and spectacle of entertainment, as well as practical design applications. This way, transforming records into housewares isn't as unusual as it sounds. Practical and fun to use. My husband loves them!! They slide a bit on smooth surfaces so they're not the most practical coasters, but that's not why I bought them. Wonderful for the aesthetic we have in our living room. These are gorgeous and well made, I also love that every pack is unique. I love to sit these out when we have guests. They are great conversation starters. My brother says he uses the coasters regularly when relaxing at home or if he has people over. Product works great for everyday use! Fabulous gift for anyone on your list. I bought this to give as a gift. I'm extremely impressed with how adorable they are and I love the fact that they were upcycled. Uncommon goods always has the perfect gift for anyone on your list.